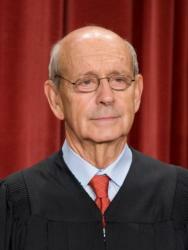 WASHINGTON (CNS) — Supreme Court Justice Stephen Breyer delivered harsh criticism of the death penalty Dec. 12 in a dissent to the court’s decision not to hear a Florida inmate’s death penalty appeal. Breyer was the lone dissenter in a three-page opinion specifically highlighting what he described as “cruel and unusual punishment” inflicted on inmate Henry Sireci, who has spent 40 years on death row and continues to argue that his conviction was based on flawed evidence and false testimony. Sireci, now 68, was sentenced to death in the 1976 murder of a used-car dealer in Orlando, Florida. During the past 40 years, he has filed multiple appeals to his conviction charge. Last year, Breyer was joined by Justice Ruth Bader Ginsburg in his dissent on the court’s decision to uphold Oklahoma’s lethal injection protocol. Breyer noted that the court should take another look at the constitutionality of the death penalty and pointed out that 137 countries have abolished the practice, leaving the United States in 2013 to be one of only 22 countries in the world to carry out any executions. In the Sireci case, the justices in the majority, following custom, did not give their reasons for rejecting it. Sireci is white, but statistics show that the odds of a convicted murderer receiving a death sentence are nearly four times higher if the defendant is African-American. Breyer also wrote that he would have reviewed other death penalty appeals the court rejected this year. He noted that the number of yearly executions has fallen from its peak of 98 in 1999 to 19 so far this year, but that the average period of imprisonment between death sentence and execution has risen. “Nor is this case the only case during the last few months in which the court has received, but then rejected, a petition to review an execution taking place in what I would consider especially cruel and unusual circumstances,” he wrote. Breyer gave the example of Ohio death-row inmate Romell Broom, an African-American, who received a botched lethal injection in 2009. “The state now wishes to try to execute Broom once again. Given its first failure, does its second attempt amount to a ‘cruel and unusual’ punishment?” he asked. Breyer’s dissent did not address the court’s ruling in January that Florida’s death-penalty sentencing process was unconstitutional because it gave too much authority to judges, instead of juries.